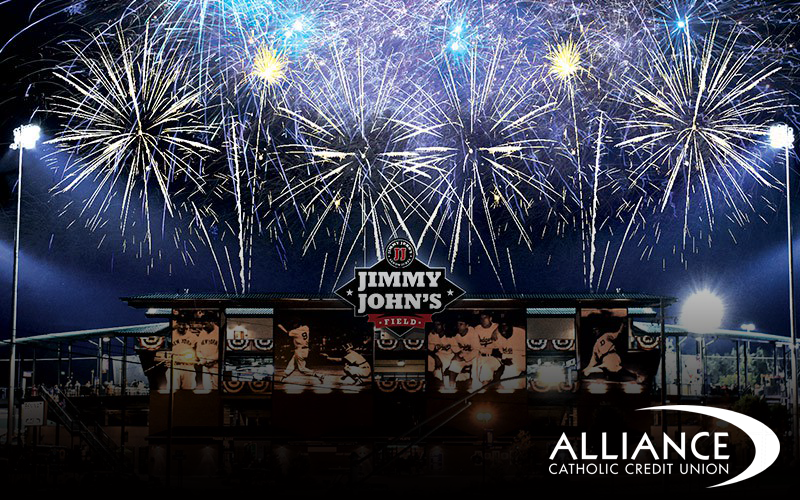 Join the USPBL for the Inaugural Catholic Night at the Ballpark presented by Alliance Catholic Credit Union, followed by a spectacular fireworks show brought to you by MetroPCS immediately following the ballgame. $20 Ticket includes access to the Private Teen Zone in the Chevrolet Pavilion at Jimmy John’s field for the Teen Dance Party, Pizza, and Unlimited Soft Drinks & Water, Fireworks Spectacular. Dance Party for Teens Ages 13 to 16. The Chevy Pavilion will feature a DJ playing today’s top hits, assorted candy bar to make you own candy bag ($5), slushies ($4), photo stations, the opportunity to be selected to participate in on-field contest during the baseball game. Show your school ID and get $1 off Dippin Dots. $1 off Fat Tire in the Short Hops Craft Beer Garden. Not applicable to the discount on Fat Tire if the Beer Batter of the Game gets a hit.